The conflict in Gaza has finally come to another inauspicious end following a ceasefire agreement. But it has established something as a cruel reality which was heretofore a perception; the sole superpower is, in fact, a puppet state of Israel. The self-proclaimed champion of human rights and torch bearer of core values of American founding fathers looked the other way at the merciless slaughter of innocent children and women. Look at the firepower used to subdue Palestinians; over 1,500 air strikes by F-16 fighter jets, Apache helicopters and drones which devastated the already impoverished territory, leaving more than 140 Palestinians dead – mostly civilians, including at least 34 children – while five Israelis also died. The ground assault of the Gaza Strip was narrowly avoided. Obama had the audacity to declare that Israelis have right to defend themselves because they felt threatened by Palestinians. It is simply laughable. It is like saying that the US feels threatened by Mexico and has a right to attack and kill innocent Mexicans. Even if we accept the right of Israel to defend itself, the disproportionate force used in this attack in order to maintain an unjustified and illegal occupation and the subjugation of millions of Palestinians was simply a criminal act. “Imagine that Egypt, Jordan, and Syria had won the Six Day War, leading to a massive exodus of Jews from the territory of Israel. Imagine that the victorious Arab states had eventually decided to permit the Palestinians to establish a state of their own on the territory of the former Jewish state. (That’s unlikely, of course, but this is a thought experiment). 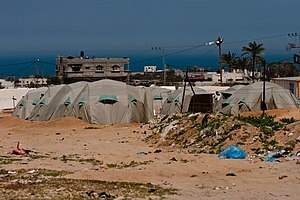 Imagine that a million or so Jews had ended up as stateless refugees confined to that narrow enclave known as the Gaza Strip. Then imagine that a group of hardline Orthodox Jews took over control of that territory and organized a resistance movement. They also steadfastly refused to recognize the new Palestinian state, arguing that its creation was illegal and that their expulsion from Israel was unjust. Imagine that they obtained backing from sympathizers around the world and that they began to smuggle weapons into the territory. Then imagine that they started firing at Palestinian towns and villages and refused to stop despite continued reprisals and civilian casualties. There were the same obfuscations and counter-claims over the causes of the renewed upsurge in violence, in which Israel again played the decisive role – not least in its extra-judicial assassination of a Hamas military leader. There was the same plea from the Israeli government that it is merely defending itself, despite its illegal occupation of the Gaza Strip that is still recognized as such by the United Nations, and despite the incredible imbalance in bloodshed and military response between both sides. And there was the same impunity given to Israel’s actions by the Western powers, the same weak response from the United Nations, and the same distortions of truth and reality from the corporate media. According to an analysis in Counterpunch, the latest siege of Gaza – jeeringly dubbed ‘Operation Pillar of Defense’ – was a crime against the Palestinian people, a cruel attack on a defenseless civilian society, and another flagrant violation of international humanitarian law. The now infamous quote of Israel’s interior minister, who pushed to “send Gaza back to the middle ages” and destroy its infrastructure, openly reflected Israel’s master plan to subject the entire population to severe forms of collective punishment, whether or not it is prohibited by Article 33 of the Fourth Geneva Convention. Hamas may be a terrorist organization but it was patronized by Israel itself as a counterweight to PLO of Yasser Arafat. PLO was a secular liberation movement having both Muslims and Christians in its ranks. The combined force of Palestinians of all faiths was a formidable force. Through Hamas, Israel successfully altered the character of Palestinian struggle to make it a Muslim-only problem and isolating and alienating other groups like Christians. Yester-years’ darling of Israel have turned against them but it is the hapless civilians who have to bear the brunt of naked Israeli force. The questions is how Israel has successfully snubbed well-meaning Americans and kept the American establishment on leash to serve the purposes of Israel’s state terrorism. This question is simply mind-boggling. Perhaps someone can find answer to this question from a detailed study of European history. Paula Broadwell was not behind Petraeus downfall….